This gluten free Earl grey chocolate souffle cake is rich, moist, and melts in your mouth but actually tastes quite light. 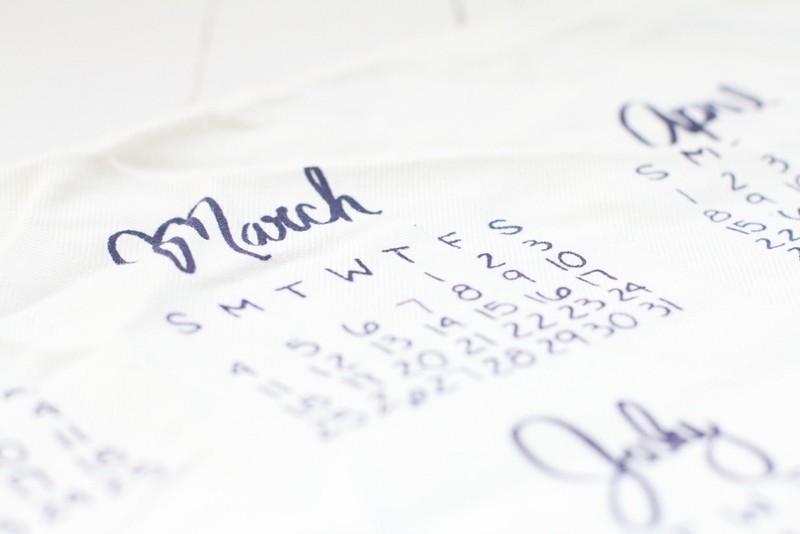 It’s perfect for Valentine’s Day and any other occasions. I know it’s been a bit quiet since last year. In early December I was in a bad car accident and have been taking time off to let my body heal. Physical therapy is helping a lot but my activities are still limited at the moment. On a good day, I can get into the kitchen and bust out a full meal but my mom and Vu have taken on more cooking so I don’t have to be on my feet as much. One thing I miss a lot is baking. With Valentine’s Day coming up, I definitely have chocolate on my mind. As a way of showing appreciation for how much Vu has taken on since my accident, I wanted to bake for him. Given that chocolate cake is his all time favorite dessert, I couldn’t think of a better cake than this Earl Grey chocolate souffle cake from Cook Beautiful. A souffle cake might sound intimidating but it’s just egg yolks and beaten egg whites combined with a few other ingredients to make a cake that puffs up during baking and collapses once cooled. The egg yolks lend a wonder, velvety texture and keep the cake moist while the beaten egg whites make it really light and contribute to the crackly top. Athena used all purpose flour in the recipe but I substituted it for almond flour to add another layer of texture in the cake. My favorite part of the cake is probably the Earl grey flavored chocolate which gives it a nuanced beautiful citrus note at the end. Athena paired the cake with candied kumquats and they complemented the rich dark chocolate flavor so well. If you can’t find kumquats, candied oranges would taste just as delicious. I served the cake with creme fraiche instead of whipped cream and it provided the perfect tang to cut through the sweetness of the chocolate. Vu, my friends, and coworkers devoured this cake and I can’t blame them! Who wouldn’t love a rich and moist chocolate cake that melts in your mouth but actually tastes quite light! I have made this cake so many times that I can bake it in sleep. This gluten free Earl grey chocolate souffle cake is elegant, timeless, and will go down in my books as one of the best chocolate cakes ever. If you’re searching for the perfect chocolate cake for Valentine’s Day, look no further! If you’re looking for Valentine’s Day dessert inspiration, you might like: Earl Grey chocolate pots de creme, blood orange panna cotta, chocolate pudding with raspberries and sea salt, and chocolate cake with espresso butter cream. This gluten free Earl Grey chocolate souffle cake is rich and moist and melts in your mouth but actually tastes quite light. Recipe is adapted from Cook Beautiful by Athena Calderone. In a small saucepan, heat the milk over medium-high heat until bubbling at the edges. Remove it from the heat and add the tea leaves in the milk to steep. Cover for 10 minutes, strain the liquid through a fine sieve and set aside. Preheat the oven to 350°F (175˚C). Grease a 9-inch (23-cm) round cake pan with butter. Line base and side with parchment paper. Combine the chocolate and butter in a large metal bowl, set it over a saucepan of simmering water on low heat. Stir frequently until the chocolate and butter are melted and smooth. Let the mixture cool to room temperature. Whisk in the infused milk, vanilla extract, and salt. In a large mixing bowl beat the egg yolks and 1/4 cup of sugar with an electric mixture until thick and creamy. Fold the egg yolk mixture into the chocolate mixture. Add in the ground almond flour. In a separate mixing bowl, use an electric mixer set at medium-high speed to beat the egg whites until soft peaks form while adding in the remaining sugar a tablespoon at a time. Continue beating the whites until they form stiff, glossy peaks. Use a rubber spatula to gently fold the egg whites into chocolate mixture in two batches. Pour the batter into the cake pan, spreading it evenly across the top with an offset spatula. Bake for 35-40 minutes, or until the cake’s center is slightly gooey and its edges pull away from the pan. When the cake is finished baking, transfer it to a wire rack and let it cool for 15 minutes, turn cake, top side up onto a wire rack and let it cool to room temperature. Dust the top with cocoa powder. To make the candied kumquats, in a small sauce pan bring water and sugar to a boil over medium-high heat until the sugar has dissolved. Add the kumquat slices, then reduce the heat to medium and simmer it until the kumquats are tender and translucent, about 15 minutes. Serve each piece of cake with creme fraiche and a spoonful of candied kumquats. In August we became a family of four but it didn’t start out that way. For the longest time, I was very happy with just ONE child. Working in the ICU, I had witnessed first hand mothers dying from complications of pregnancy and childbirth. FEAR has a way of paralyzing you. It’s a powerful force that cemented my decision. Why risk it when we were already blessed with a healthy child! I felt like we had won the lottery with our first born. He is a sweet and easy going boy that brings us so much joy. I was happy with our family set-up. Traveling was a breeze. We could fit neatly in one row on an airplane. It was easy to wrangle one rambunctious toddler with two parents. The past few years were challenging but we had finally found our rhythm so why upset the balance. Everything was chugging along just the way I imagined until last June when we went out to celebrate Father’s Day. There was an elderly couple and their son sitting next to our table. The couple must have been in their 70s and their son in his 30s. They started dinner at about the same time as we did. For the duration of dinner their son was on his cell phone while his parents quietly conversed with each other. My husband noticed me tearing up and badgered me until I caved in and told him how upset I was seeing his parents neglected. His cell phone was the object of his affection instead of his father. A part of me panicked thinking what if that was us and our son in the future! Since that night, my thoughts drifted frequently back to that scene. Then I remembered how alone I felt when my mother was battling uterine cancer and breast cancer. I had no one to confide in or share my burden with. I pretended to be strong for my mom but inside I was terrified of losing one of the greatest loves of my life. A friend could lend me her ears but it’s not the same as having a sibling to lean on. While there’s no guarantee that siblings would get along or become close, we are optimistic that we can raise our kids to love one another and take care of each other. Thanksgiving came around and I thought about the holidays being more fun if there were two kids running around. Double the noise. Double the mess. But double the joy. For the first time in a long time, a little voice started whispering the idea of a second child. I began opening up to Vu. We went back and forth about the pros and cons of having another addition to our family. Let’s just say the list of cons was a lot longer than pros. Both of us are older and working on our careers. We have no help and the cost of childcare in this country is abhorrent. Whatever amount of free time and sleep that we enjoy now would become non-existent. And of course the cost of raising another child, an additional $250,000, not including college! I had never imagined that the decision to have a second child would be one of the hardest decisions of my life. Against all odds, we decided to go ahead because life decision can’t really be based on a table of pros and cons. Ultimately our heart tugging won and we didn’t want to be in our 50s thinking about what could have been. I had a small window of time to get pregnant and we both agreed to be at peace with whatever the outcome was. As luck would have it or fate as some believe, we got pregnant in that small window of time and welcomed our second boy, Dillon, in August. From the moment we heard Dillon’s heart beating on the ultrasound to his first cry when he made his debut in the OR, we fell in love again. Things have been really hard but we’re taking it one day at a time. For those parents out there who are struggling, we feel your pain. In retrospect, we would have been happy with one child, two, or none at all but now that we’re a family of four, we can’t imagine our life any other way. To celebrate us all making it to three months, I made a chocolate cake. I reserve cakes for special occasions and this is definitely one of them. When I was pregnant, I had the worst heartburn and couldn’t have chocolate or coffee. Now that my body has somewhat recovered, I’m enjoying chocolate in all forms. This simple cake totally hits the spot but leaves you wanting more because of the espresso frosting. I don’t know about you but chocolate and coffee are a match made in foodie heaven. Our friends and coworkers really enjoyed this cake when we made it for birthdays and potlucks. We couldn’t be more excited to share this special occasion and recipe with you. 1. Preheat the oven to 350 degrees F. Grease and line two 6 inch cake pans with baking paper. 2. Place the butter, sugar, and chocolate in a heatproof bowl over a small pan of simmering water and make sure not to let the bowl touch the water. Stir the mixture until everything is melted and smooth. Remove from heat and set aside. 3. In a mixing bowl, sift flour, cocoa, baking powder, baking soda, and salt. 4. Transfer the chocolate mixture to the bowl of a stand mixer with the paddle attachment. 6. Add the vanilla and whisk to combine. 7. Fold in the flour mixture and whisk in the milk. 8. Divide the batter between two 6 inch cake pans, place them on the middle rack, and bake in the oven for 30-35 minutes until a toothpick inserted into the center comes out clean. 9. Cool the cake in the pan for 10 minutes then transfer to a wire rack to cool completely. 10. 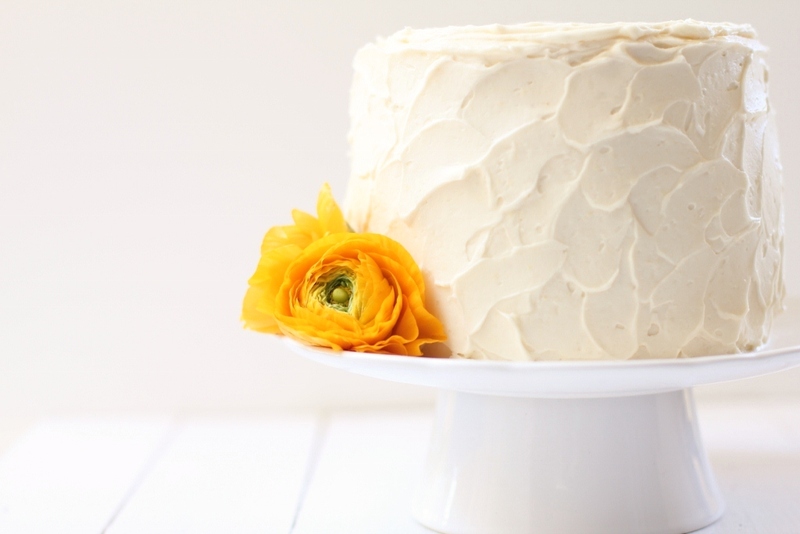 While the cake is cooling, make the buttercream. Place the chocolate in a heatproof bowl set over gently simmering water and don’t let the bowl touch the water. Stir the chocolate until melted and smooth. Stir in the espresso powder and vanilla extract. Remove from heat and set aside. 11. In a stand mixer with the paddle attachment, beat the butter and icing sugar for 8-10 minutes until very thick and pale. Fold in the espresso chocolate mixture and whisk until well combined. 12. When ready to frost the cakes, use a serrated knife to level the cakes. 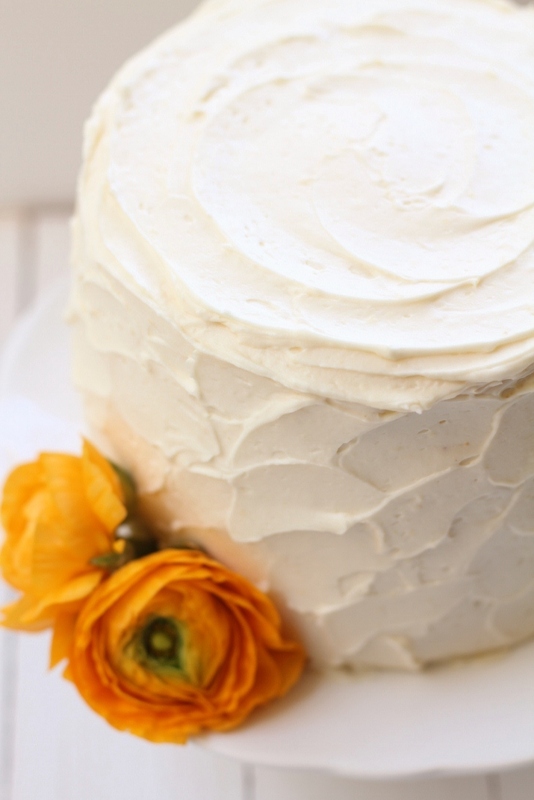 Place one layer on a cake pedestal. With an offset spatula, spread about ¼ cup of buttercream over the top. 13. Place the second layer on top of the buttercream, then spread the remaining frosting evenly on top and sides of the cake. 14. To make the chocolate shaving, use a vegetable peeler, scrape the blade lengthwise across the a block of room temperature chocolate. Top the cake and bottom of the cake with chocolate shavings. 1. For baking use good quality chocolate. 2. Make sure the cakes are cooled completely before you frost them or the frosting will melt. 3. The cake will keep in the refrigerator covered in plastic wrap for up to two days. We love cakes at our house but not those sugar laden cakes. I tend to focus on flavor instead of sweetness when it comes to desserts. I first made this cake a few years ago when our Meyer lemon tree was bearing lots of fruits but it caught the citrus greening disease and was finally retired this year. I was really bummed about our lemon tree but my friend Gail came to the rescue and gave me many pounds of Meyer lemons over the past few months. When your friend gives you lemons, there’s nothing to do but to bake a lot of cakes and make a lot of ice cream and sorbet. 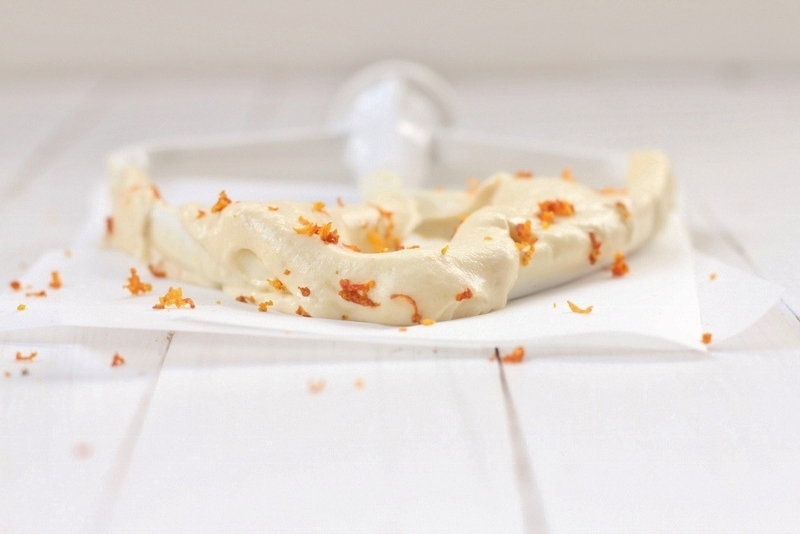 This will be the first Meyer lemon dessert I’m sharing with you. If you don’t have Meyer lemons, regular Eureka lemons will taste just as good. 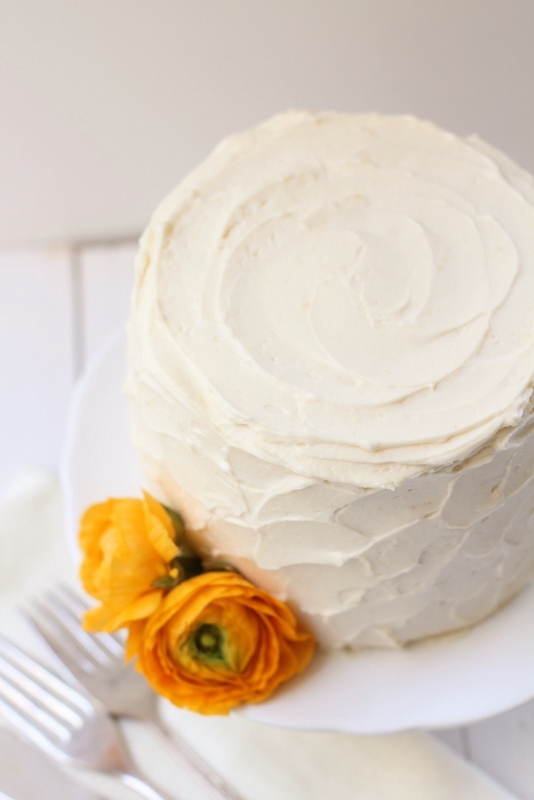 This cake has a nice lemon flavor and makes the perfect afternoon treat! We’ve been guilty of eating it for breakfast and after dinner with a scoop of vanilla ice cream too! Enjoy! 1. Sift together flour, baking powder, baking soda, and salt in a mixing bowl. 2. In a small bowl, whisk together the yogurt, olive oil, lemon juice, and zest until well combined and set aside. 4. In a stand mixture, fitted with the whisk attachment, beat eggs on high speed while gradually adding in the sugar until the volume doubles and becomes thick and pale yellow, about 5 minutes. 5. Decrease the speed to slow and whisk in the yogurt mixture until well combined. 6. Add the flour mixture in two batches and mix until combined, scraping down the sides as needed. 8. Top the batter with chopped pistachios. 9. Bake for 45-50 minutes or until a skewer inserted in the middle comes out clean. Check on the cake 30 minutes into baking and if the top starts to brown too much, place a piece of foil loosely over the top. Remove the cake from the oven and let it cool for about 20 minutes. 10. To make the syrup, add the sugar, water, and lemon juice to a small saucepan and bring to a boil over medium-high heat until the sugar dissolves, stirring frequently. 11. Decrease the heat to low and add in the lemon slices and gently simmer for 10 minutes. 12. Remove from heat and let it cool to room temperature. 13. With the cake still in the pan, take a skewer and pierce the top all over, to about three-quarters of its depth. 14. 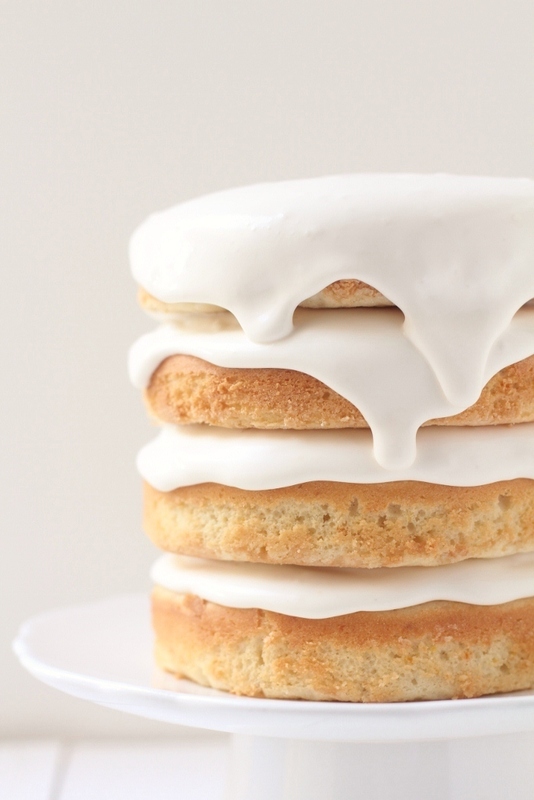 Drizzle the syrup all over the cake and arrange the reserved lemon slices on top. 15. When ready to serve, slice each piece to about half an inch. 16. The cake is best eaten immediately but will keep for 5 days in an airtight container or up to 1 month if frozen. My new year started off with a few hitches. Vu slammed the door against my thumb but luckily nothing was broken. Then a few days ago, I was exiting the freeway and the car in front of me made a sudden stop. I heard a loud boom. Yes, I had hit it. I had not slam on my brake fast enough. I sat there, dazed. My first accident. Then panic overwhelmed me. Were the people in the other car hurt? They were ok. I was ok. I drove home, still shaken but feeling incredibly grateful that it was only a fender-bender. Then yesterday, my birthday arrived. The last year of my 20s before the big 3-0 as Vu had put it. When I came home, he greeted me with a big bouquet of hydrangeas, one of my favorite flowers. We celebrated with a simple dinner of shrimp cocktail, lobster rolls, and best of all, a lemon poppy seed cake and strawberry passion fruit cream for dessert. This was the first cake that I have ever made. It was moist and the brightness of lemon flavor came through. Like a burst of sunshine. Rather than making a vanilla pastry cream that the recipe calls for, I made a strawberry passion fruit cream. The strawberry passion fruit cream was fragrant and light. The pairing was delightful. It was a perfect birthday. Simple and relaxing. Exactly what I needed after a long week of work. I am looking forward to enjoying the last year of my 20s, to self discoveries, growth, and a new chapter in my life. 1. Preheat the oven to 325˚F. Grease the bottom and side of two 5-by-2-inch round cake pans with butter. Line the bottom with parchment paper. 2. Sift together flour, salt, and baking powder. 3. In a bow of a stand mixer fitted with the paddle attachment, beat together sugar and butter until light and fluffy, about 5 minutes. Switch to a whisk attachment and add the eggs, one at a time, mixing until well incorporated. Add the sour cream, lemon zest and juice. 4. Mix the sifted ingredients in several additions until combined. 5. Add the poppy seeds and mix until blended, but be careful not to overmix, as the poppy seeds can change the batter color. 6. Pour the batter into the pans and bake until the top of the cake is slightly golden brown and a toothpick inserted into the center of the cake comes out clean, about 45 minutes. 7. Remove the cakes from the oven and allow to cool to room temp. 8. Once cooled, remove the cakes from the pans and peel the parchment paper from the bottom of the cake. 1. Halve the passion fruits and scoop out the pulp and seeds into a small pan. 2. Boil the passion fruit until the volume is reduced by half. 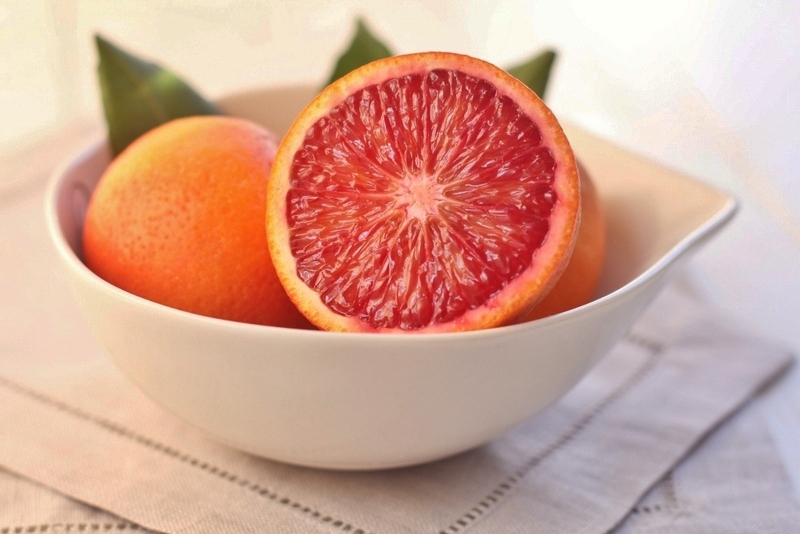 Strain the juice through a sieve and chill in the refrigerator. This step concentrates the flavor of passion fruit. 3. In the bowl of a stand mixer fitted with the whisk attachment, whip the heavy cream until light and fluffy. Add the icing sugar and continue beating. 4. Beat in the mascarpone cheese until well blended. 5. Mix in the passion fruit reduction. 6. Use a spatula, fold in the diced strawberry. 1. 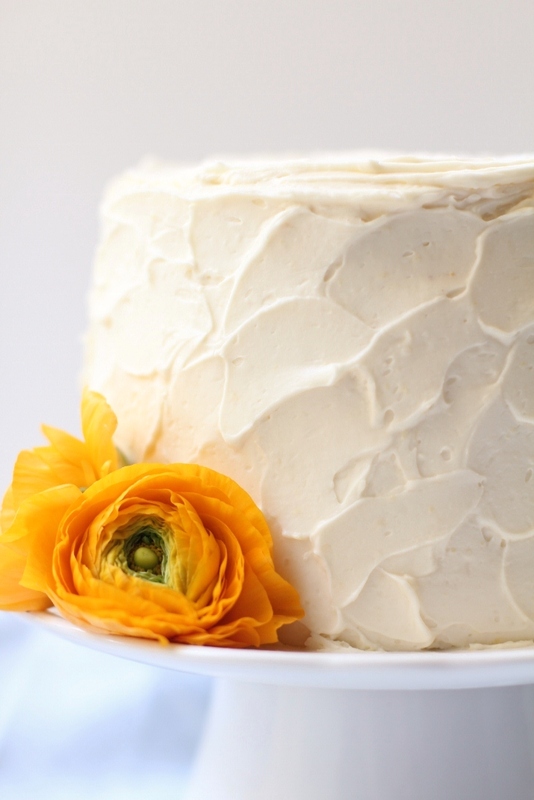 Use a long serrated knife, slice off the top ¼ inch of the cakes to even out the top. Slice each cake into 2 even layers. 2. Place the first piece of cake on a cake stand. Using an offset spatula, spread 1/3 cup of strawberry passion fruit cream evenly onto the cake. 3. Place another piece of cake on top of the cream and repeat the previous steps with the remaining pieces of cake. 4. After the final piece of cake is topped with cream, garnish with lemon zest.